This recipe makes the most of the seasonal local organic produce that is in store at Fresh Choice Nelson. There is so much to choose from in store and I love utilising the seasonal changes of fruit and veges. The local organic produce in this salad can be easily substituted for what is in season at the time of creating it. Preheat oven to 180 degrees, slice courgette and eggplant into thin strips (1/2 cm) and place on a lined baking tray. Sprinkle veggies with sea salt, 2 tbsp olive oil and 2 tbsp apple cider vinegar. Bake for 20 mins until soft then remove from oven and set aside. In a blender or using a hand whiz combine all the dressing ingredients and set aside. Remove stalks from kale and slice leaves very thinly, place in a large bowl and dress with 2 tbsp olive oil and a good pinch of sea salt, massage the kale firmly for a couple of minutes until it softens (you can also add half an avocado to this mixture before massaging, for extra flavour). Thinly slice the beetroot and spring onions and gently mix in with the kale along with lettuce leaves. Cut the cucumber into chunks and add to the salad then top with sprouts, basil leaves and roasted veggies. 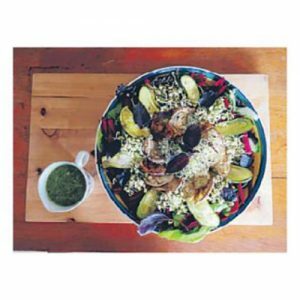 Serve this lovely salad full of local organic produce, drizzled with the herb dressing and accompany with Nelson made sourdough bread. Thanks to our Guest Blogger, Maddy Bellcroft – Find Maddy on Facebook.